Following the code used both here and here, using \hyphenrules should inform polyglossia about breaking points within a word. The following code does not break the word in question. Why not? What can I do? I'm using version 1.43 of polyglossia. 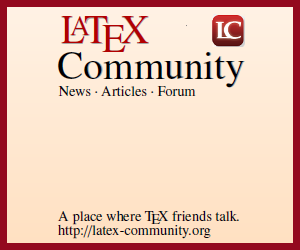 TeX doesn't hyphenate words that contain a hyphen (precisely the current \hyphenchar for the current font). The \nobreak (that is, \penalty10000) disallows a break at the \hspace, which on the other hand allows hyphenation for the following word part. Here I use a safer definition, that does nothing if \allowhyphens happens to be found in vertical mode. It is essentially the same as in babel. Note that de-ri-va-tio-nal is very wrong for English hyphenation rules. In German language this is a well known problem, because german language contains a lot of concatenated words, single words divided by -. For example: Baden-Württemberg. 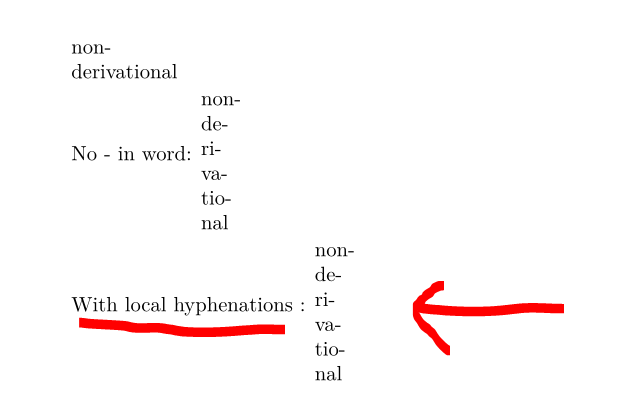 If you need hyphenation in the single words you need to add local hyphenations with \-. 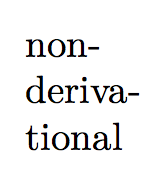 In your case change non-derivational to non-de\-ri\-va\-tio\-nal. How to set the minimum characters for hyphenation?